Every song that gets uploaded to Songtree can be overdubbed or modified. This process is non-destructive, as the original song does not actually change. What happens instead is that a new version of the song is created and added to the song’s tree. 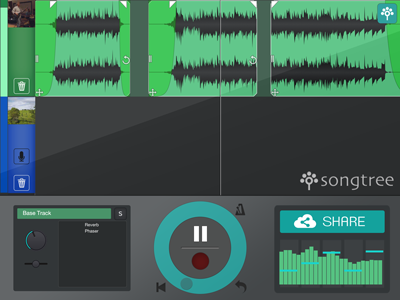 To overdub a song, simply click on the record button on the right of each song. Songtree will automatically import the song to the Record view. Here you can edit the original song, or apply effects to it. To add your contribution, simply hit record and you will be recording audio over the existing song. Once recorded your part, you can upload it back to the songtree community by hitting the share button. The song will be automatically added to the song-tree of the parent song. Tip: make sure you set an appropriate level for both your part and the track you are overdubbing before you share it: this allows for a cleaner mix as new overdubs get added by others. To record audio at a higher quality, or use third-party apps, Songtree also supports external audio interfaces and audiobus. Can I record or overdub using my Windows or Mac PC? To overdub a song you currently need the Songtree iOS or Android app. 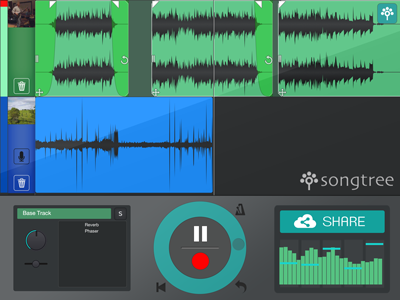 The app recorder lets you overdub a song in 'live take' mode. 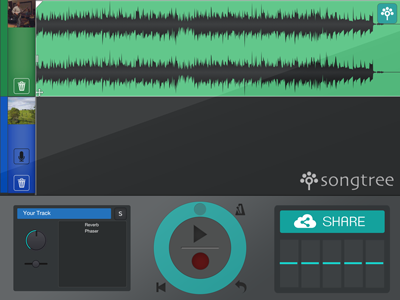 To overdub or upload via desktop or third party apps, you can export recordings from Songtree or import an audio file from your computer. To import or export recordings from and to Songtree, see Importing and Exporting Tracks.